The bulb lights up pretty much straight away but Gelert suggest you need about 1 minute of winding to get about 20 minutes of light. We found this to be a bit optimistic - the light is only really bright for about half that time, after which it slowly starts to dim, requiring more winding. It is not practical to wind up the torch with it in position on your head. 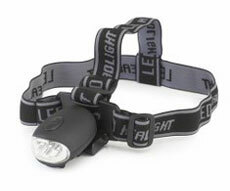 We all know we should carry a torch of some description in our rucksacks in case of emergencies (along with a whistle and survival bag) and this is a lightweight, reliable and easy to use head torch. If you habitually enjoy walking in the dark, or know you will be unable to complete your next walk in the available day light, then a good quality battery-operated head torch will give you brighter light and is less likely to go all dim on you at a crucial moment. However, if you only ever need a torch on rare occasions (or have had a torch in the bottom of your rucksack so long, the batteries have started to leak) then the Gelert 3 LED Wind Up Head Torch could be invaluable.